Hello Nosh Show Listeners! We are back with Episode 96! It's that germy time of year so Ryan was out sick. Thankfully Chris from Junk Banter responded to our last minute call for assistance. We've got a bunch of followup to get us started and then we dive in to Nosh or Not which includes two new flavors from Ben & Jerry's. I didn't have any official followup for the show, but I do discuss the two new Chips Ahoy Thins flavors. My family is a big fan of the original flavored Chips Ahoy Thins so I was pretty excited to stumble upon these at Market Basket (and then several other stores) and bring them home. First up is the double chocolate chips ahoy thins which taste probably like you would expect them too. Nothing ground breaking here, just more chocolate. Wait, let me put it a better way than I did on the show since I've had a few more since then. Basically the double chocolate ones taste alot like brownie brittle. That is not a bad thing by any means and I apologize if it came across that way in the show. If you've ever wanted to try brownie brittle but were afraid of the cross contamination with nut products, give these a shot instead. I actually bought two packages of the dc because I assumed they would get inhaled pretty quick. The fun thing about CA thins is that you may grab as few as two or as many as eight. I love that each one is worth a handful of calories so you can just grab whatever you want. The other new cookie is the oatmeal chips ahoy thins and I don't know how well this will click with people. I talk mostly about this one on the show because I feel like it's just trying to throw everything in the mix. It's chips ahoy thin meets oatmeal raisin cookie. It hits lots of different flavor notes but that doesn't mean it translates in to a wow factor. The other two products in the above photo are not talked about on the show. Campbell's well Yes! soup basically tastes like a Progresso ripoff with a bit more salt. It tastes fine and I'll probably try some of the other flavors, but it was just funny how similar it tastes to the competition. I was hoping the belvita yogurt sandwiches would taste like the short lived Quaker oat & yogurt sandwiches but no such luck. Not even close. The yogurt is tangy and the wafers are boring. 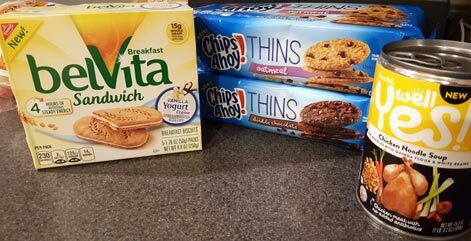 So, how do you feel about chips ahoy thins and are you on the lookout for these new flavors? Also, if you have to pick between Truffle Kerfuffle and Urban Bourbon, which would you choose? Have a good week everyone! I'm going to look for both B&J flavors but the bourbon one sounds more appealing and unique to me. Like you Dubba I'm not a huge drinker, but I love a novel idea.